I hated cantaloupe when I was a kid and can remember gagging it down a few times, repulsed by both its taste and texture. My kids (save the eldest) did not inherit my juvenile cantaloupe-hating gene and actually have to have their melon intake regulated so there are no ill effects at the other end. 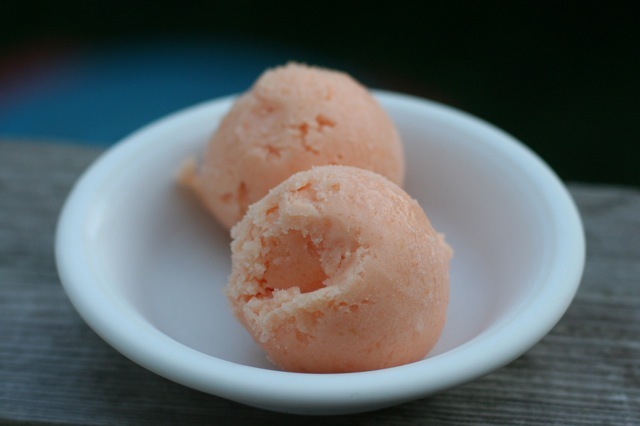 But even if you are not crazy about muskmelon, this is a wonderful sorbet with a mellow flavour and smooth texture. It's more or less a play on my Strawberry Daiquiri Sorbet. For those who wonder about the alcohol, it inhibits freezing and gives the sorbet a softer and smoother texture. You don't have to use it, but it is better if you do. 1. Place diced cantaloupe and sugar in a food processor and process until smooth. Add lemon juice and tequila and blend. 2. Place mixture in the fridge for an hour to chill, then process in an ice cream maker. Transfer to a container and freeze overnight before serving. Happy 8th Birthday, Son #2!